And now, think about your manager. This individual needs to drive results for you and your peers. Why might tracking and measuring your activities help with this? Even if you’re at the top of your game and can’t possibly improve your results or complete more activities - why might this still be important? (Hint: when you answer this question, it may also help you to brainstorm more reasons why under the “Collaborating” heading, above). One bit of advice: When answering why activity management might be important for coaching and leading, try not to be cynical. Many users of CRM feel that CRM can feel like “big brother is watching you.” My personal experience is that: (1) this is rarely the case, and (2) if it is the case, your organization has a cultural issue that is far bigger than CRM. Give your manager and leadership the benefit of the doubt and assume that there are good reasons why they need you to track and measure activities - try to discover those reasons. 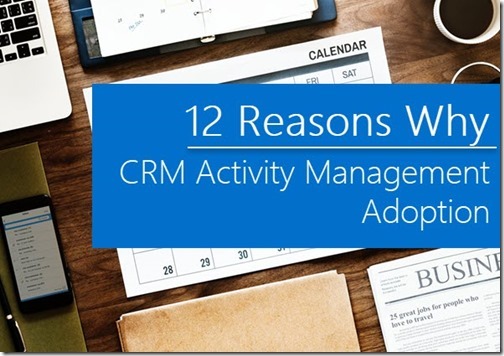 Then, when you’re done, you can click here to download our list of Why Activity Management in CRM to put the final touches on your list. But don’t cheat - try it on your own first!